Every summer, I’ll throw a big party. The guest list isn’t so big as the thought and planning that goes into it. I’ll call up my inner circle of overachieving crafty types and together, we’ll pull out all the stops, dreaming up menus, creating handmade invitations and doing DIY decorations. Sometimes, we’ll hold up in the kitchen for days, cooking canapés until every last crab cake, dumpling and beggar’s purse is prepped, plastic-wrapped and refrigerated. (In a pinch, you can find me in the freezer section of Trader Joe’s debating the merits of miniature quiche.) The occasion varies—a backyard bash for the 4th, a princely feast for Jaithan’s birthday—but the spirit of coming together to celebrate summer’s greatest gifts lives on. Recently, I gathered guests on our lawn at Pine Hill for a sweet and savory party celebrating the engagement of friends Jessika Goranson and Mark Lewand. 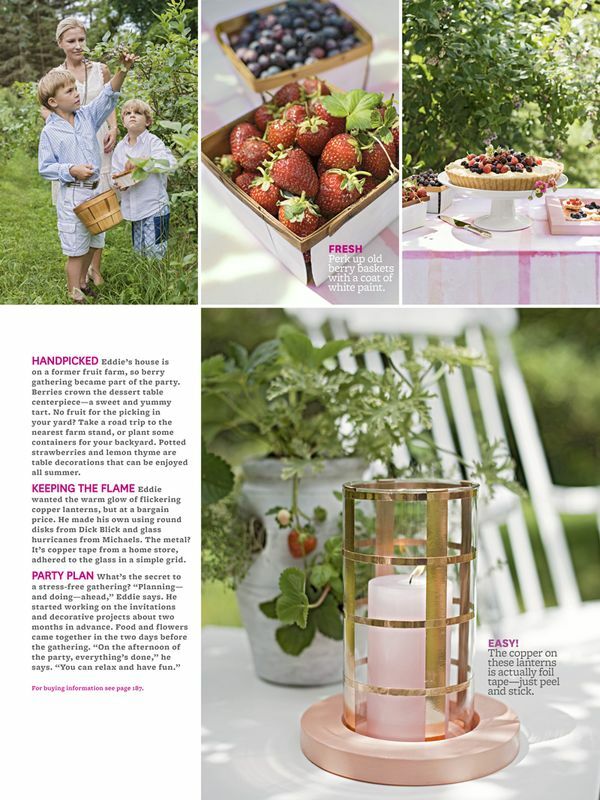 Better Homes & Gardens captured the day’s events, proving that you don’t have to wait for someone to pop the question to celebrate summer your way. When you’re entertaining outdoors, flowers don’t have to be pricey. Queen Anne’s Lace is abundant and pretty this time of year. Just pick whatever is in bloom. Here, farm-fresh blackberries mingle with the fragrance of just-cut roses. We made the tablecloths from simple cotton sheets dyed with festive berry-colored stripes. In Jessika and Mark’s case, opposites attract: she likes savory flavors; he’s the one with the sweet tooth. That message comes through on the menu and in the invitations. 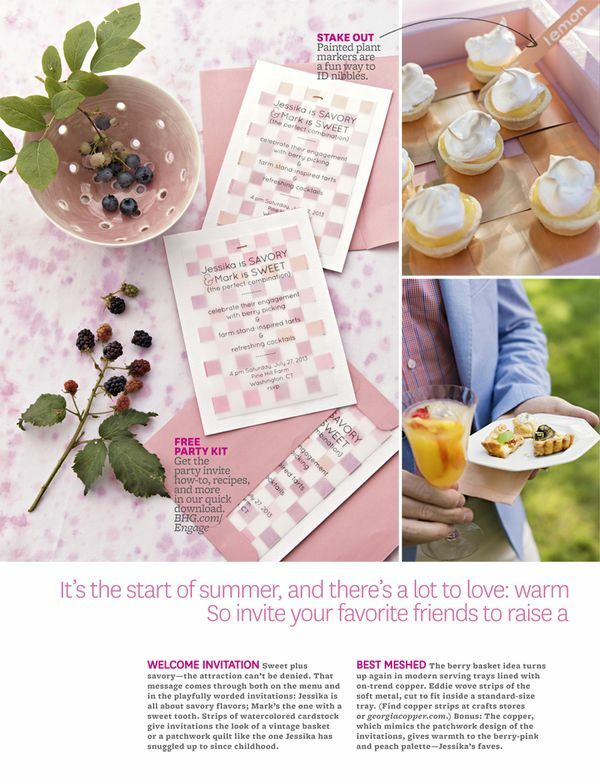 Strips of watercolored paper give invitations the look of a handwoven basket. I carried the look to modern serving trays lined with copper cut into strips and woven to fit. Here’s a how-to video in case you want to make your own. Party nibbles can be as simple or elaborate as you want. A few days ahead, we filled store-bought tarts with savory and sweet fillings. Buy the frozen kind if that’s easier for you. Either way, garnish with fresh herbs, serve them on a pretty tray and no one will ever know the difference! As for drinks, a self-serve station with (spiked) lemonade or punch frees you up to start a dance party mingle with your guests. And on hot days, iced fruit like strawberries, cherries or grapes is a refreshing bar-side snack. Check out this video for how to set up your own self-serve bar. Pine Hill is a former fruit farm, so berry-picking became part of the day’s festivities. To perk up old baskets, I gave them a fresh coat of paint. Berries turn up on the dessert table, too, crowning the centerpiece—a sweet and tangy tart made with fresh lemon curd. I made the lanterns using peel-and-stick copper tape and hurricanes from Michael’s. After a day of glorious good fun cocktailing, berry-picking and toasting the bride and groom to be, guests went home happy with a tasty takeaway mixing savory and sweet flavors—Lemon Thyme Shortbread cookies in muslin bags splatter-dyed to evoke berry stains. Thank you to everyone who helped turn this party out! You know who you are! 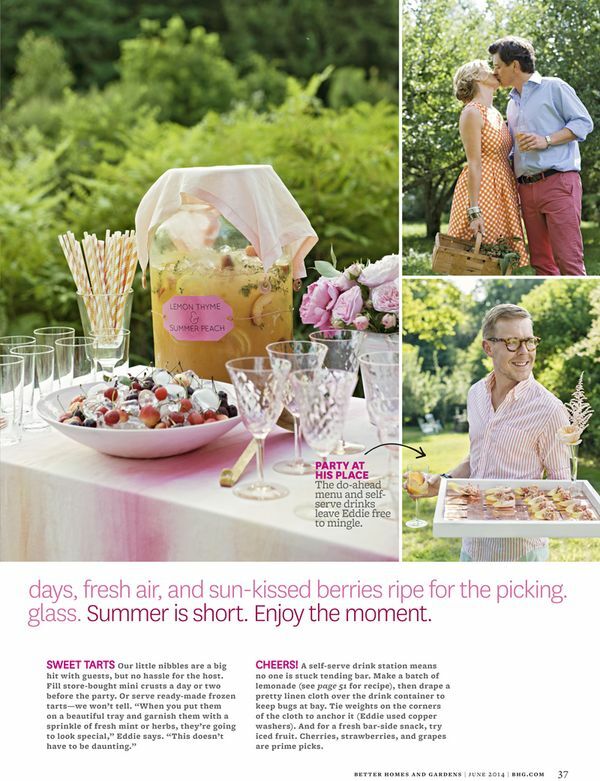 Finally, here’s a video we made to inspire your next alfresco fête. Summer is short, everyone, so let’s make the most of it! 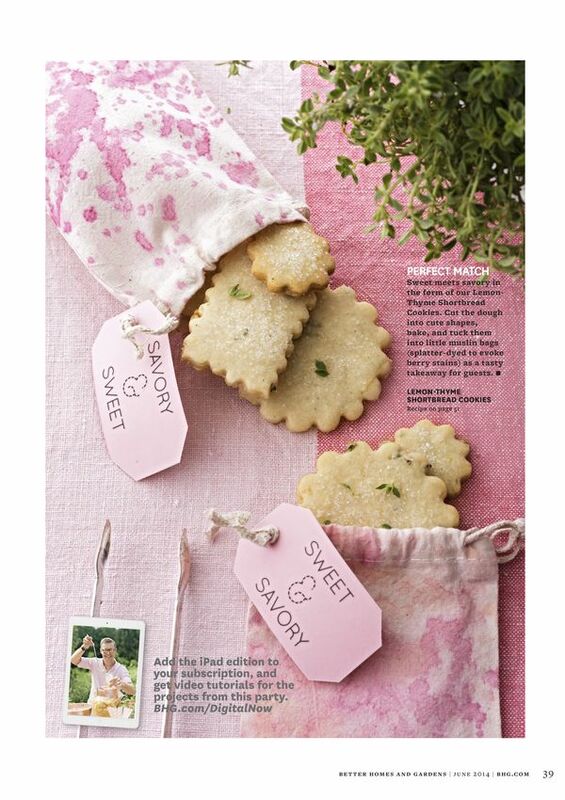 Don’t think for a minute that I won’t be trying your lemon-thyme shortbread cookies this summer. And that kitty! Happy parties (and households) welcome lovable four-leggeds. Ain’t no party like an Eddie Ross party!! You always have the most creative ideas, Eddie. Kudos to you and your team for putting together such an beautiful celebration. your abundant creativity has no bounds. what a beautiful party for your friends! What a wonderful party! I saw this in the magazine and thought how fabulous it was! Having you detail it more just edifys that! I know your friends enjoyed it all so much. You have so much talent my friend… I just love all of your work. 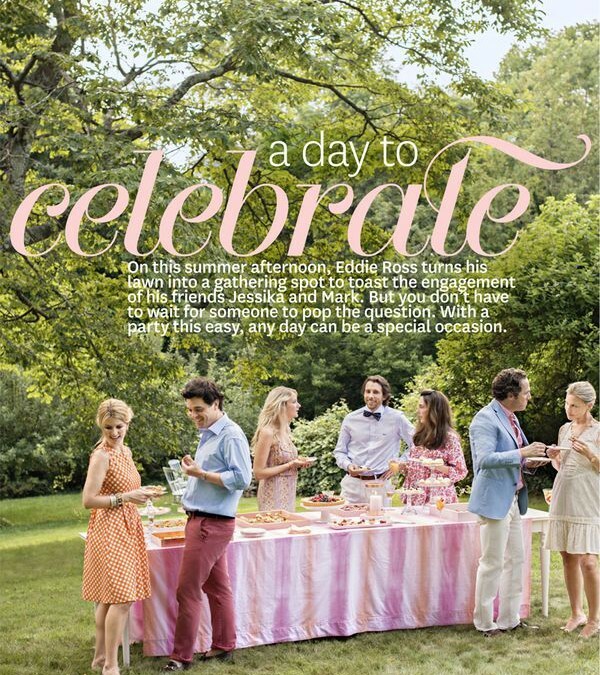 What a lovely way to celebrate a special occasion or even an ordinary summer day! Green & pink has always been my favorite color combo, but you made it even more special by adding touches of creamy yellow and copper. And that mixed berry tart with lemon curd? Mmmm. I will be baking that for my mother-in-law’s birthday this Saturday. Would you share the recipe for that?? Looks like such a fantastic party! And what an amazing home. 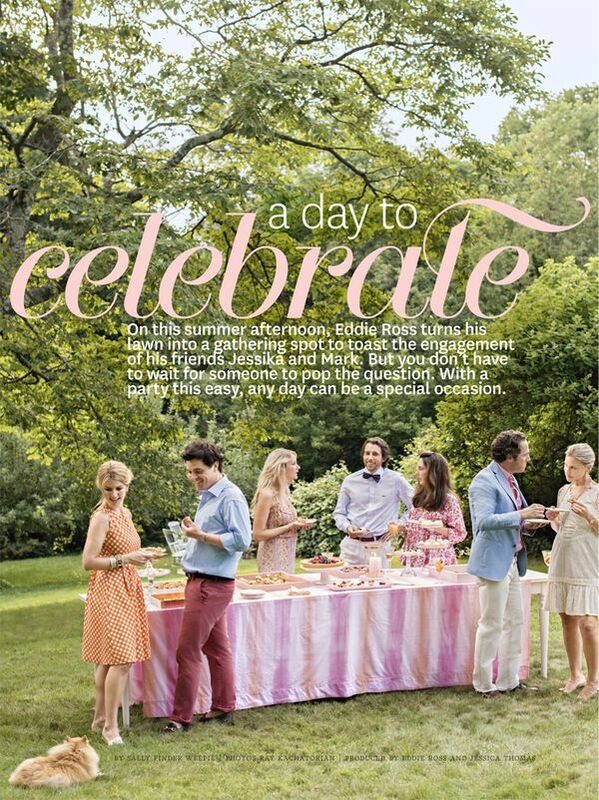 You are so right about party planning! I almost think it is the best part. Such a lucky couple to be able to celebrate with you at such a lovely party. I loved your idea of using copper tape for the lanterns. Genius, as usual! xo, N.G. Eddie, as always you and Jaithan have created another glorious event with all of the best for your dear friends! 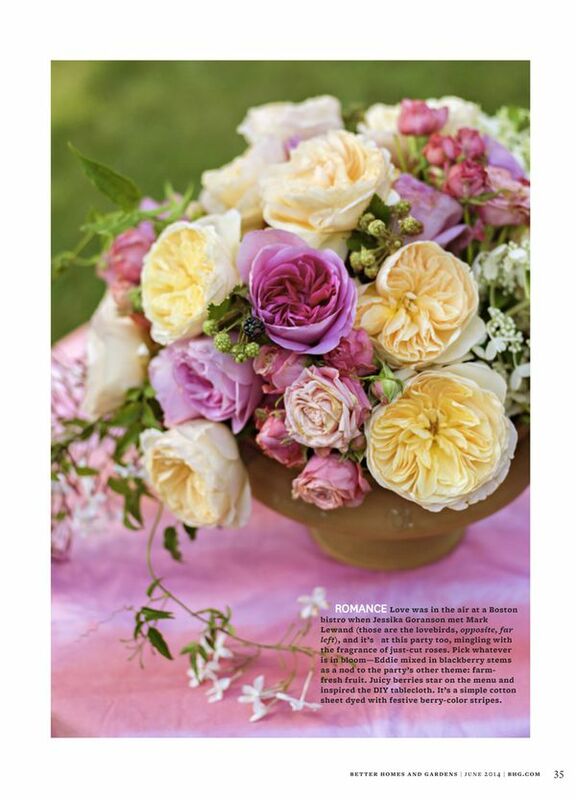 I love the color palette and gorgeous florals!